Catalog sales is the most profitable way to sell in today's booming direct-mail industry. In fact, catalog sales now represent a more than $12 billion industry. More and more small business owners and entrepreneurs are realizing the profit-making potential of this powerful selling tool. 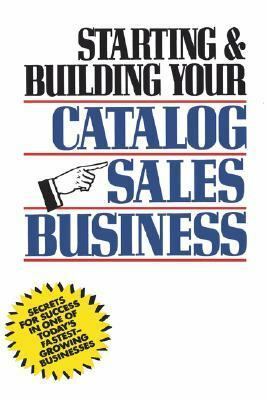 Now, with the help of this book, you can learn everything you need to know to succeed in catalog sales as well. Written by Herman Holtz, one of America's top consultants, speakers, and bestselling authors, Starting and Building Your Catalog Sales Business shows you step by step the tricks of the trade, including:What types of merchandise typically sell well by catalogSales, advertising, and marketing basics via catalogs and mailHow to write catalog copy that sellsThe important and necessary elements in any catalog mailing-including how to create an effective sales letterWhat you need to know about mailing lists-where to rent them, what they cost, what kinds and categories are available, and how the list-rental business worksWhat it takes to succeed-frank advice about business and the two most critical factors of business success: adequate sales volume and realistic pricingPlus-what you need to know about accounting, how to finance your catalog sales business, and lists of the leading renters of mailing lists, cooperative mailers, wholesale sources of supplies, and more!Packed with anecdotes, worksheets, and examples drawn from successful catalog sales businesses, Starting and Building Your Catalog Sales Business is the starting point for anyone who wants to start up and succeed in this lucrative field.Holtz, Herman R. is the author of 'Starting and Building Your Catalog Sales Business Secrets for Success in One of Today's Fastest-Growing Businesses', published 1990 under ISBN 9780471508168 and ISBN 0471508160.